Honestly, it’s never really been my thing. It’s a Hallmark holiday, but it’s good business for florists. In my world, you should show someone you love and appreciate them all the time, not just one day a year…. Okay. Having got that crankiness off my chest, let’s turn to the task at hand. Love it or hate it, Valentine’s Day is a great excuse to indulge. It’s far enough away from New Years that you don’t have to feel super guilty about breaking a few resolutions, and, I mean, hey! it’s Valentine’s Day! You deserve a little chocolate and wine. Either because you have a great relationship, or you don’t. Either is a perfectly good reason in my books. I enjoy learning about wine. I’m not the biggest connoisseur in the world, beyond the fact that I know what I like. I am also a big fan of dark chocolate. And, as it turns out, dark chocolate (because it tends to be lower in sugar and more savoury in nature) can actually pair quite well with wine. So, if you wanna drown your sorrows this V-day, or share your chocolate and wine with someone else (I think I might rather hoard mine all to myself), I have some suggested pairings for you. Then, to begin the pairing, take another piece of chocolate. Savour the taste as it slowly melts in your mouth. Notice the complex changes in taste as the wine mingles with the residual chocolate flavour. I wandered into Lindt yesterday to get my fix, and they have a new bar out, which features chunks of raspberries. This is one of my favourite flavour combos. It goes great with a cabernet sauvignon, which has lots of plummy and blackberry notes. Some like it hot! The spiciness of the Chili Chocolate is a great match for the cherry notes in a bold Pinot Noir. For those of you out there with a fiery, passionate relationship, this is your pairing. This Okanagan Riesling is under $20. The riesling has notes of citrus and stone fruit, and that pairs great with the citrus in the chocolate. This is a lighter pairing, for those of you who aren’t attracted to dark, bold reds, but want something lighter and less complex. The Lindt Dark Chocolate Sea Salt is my favourite. It’s the one I come back to again and again, and it’s very seldom that I don’t have one in my house. I love the sweet/savoury pairing, and the salt brings out the chocolate. The plum and pomegranate notes in the merlot go nicely here. Not a fan of dark chocolate? A lot of people don’t even consider white chocolate to be chocolate, because it has the lowest amount of cocoa solids. Dark chocolate has a minimum of 70%, and white chocolate only has 30%. But some of you really like it. Ideally, because it’s sweet, you want to pair it with something sweeter, like Bailey’s Irish Cream. 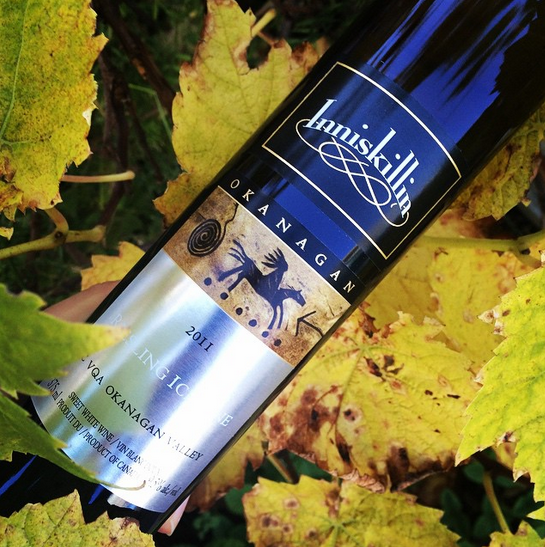 Inniskillin makes a great local ice wine. Milk chocolate has somewhere around 35%-50% cocoa solids, and is much sweeter than dark chocolate. Pair it with a finishing drink, something sweet, like an ice wine, a sherry or a Port (basically some kind of sweeter, fortified wine). One of my local faves is Langley’s Vista D’oro’s Walnut Fortified Wine. There you have it! Go out and collect some bottles and collect some chocolate and have a blast this Valentine’s Day–and remember, if you can’t be with the one you love, love the one you’re with.